Fluorescent staining can be used to simplify traditional methods by mixing a cell membrane permeable DNA dye (acridine orange and propidium iodide) with diluted whole blood sample that specifically stains white blood cells. This is an ideal solution for many complex cell population characterization assays such as rapidly counting white blood cells in whole blood. Nexcelom’s Cellometer automated cell counters are able to quantitatively analyze WBCs by simply pipetting 20 µl of treated sample into a Cellometer disposable counting chamber and placing the chamber into the instrument. Since the counting chamber is disposable, no washing is required between samples, there is no risk of cross contamination of different samples, and the risk of exposure to biohazard materials is reduced. Using proprietary algorithms, the Cellometer’s robust operating software accurately analyzes cell images, and generates counting data in less than 60 seconds typically. Cell images and all analysis data, including cell size distribution histograms, can be saved for documentation. Data can also be easily exported to Microsoft Excel spreadsheets for further analysis. Live nucleated cells are stained with AO (green) and dead nucleated cells are stained with PI (red). Cellometer software automatically identifies and counts stained cells. Live AO positive cells are outlines in green, while dead PI positive cells are outlined in red. 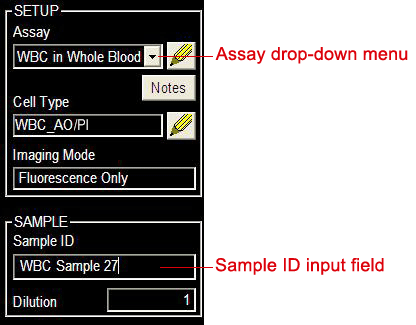 Collect the peripheral blood sample (20 – 50 µl). Take 20 µl of blood sample and dilute the sample in 180 µl of PBS. Mix 100 µl of Acridine Orange/Propidium iodide (AO/PI) solution to 100 µl diluted blood sample. AO Stained WBC’s are clearly visible in the acquired fluorescent image. The software indicates counted cells with a green circle (enlarged to show detail). Results display indicates fluorescence cells counted and automatically calculates concentration. Fluorescent images showing AO stained WBCs (left) and counted WBCs circled in green (right). RBCs are not visible. Cell and fluorescent size distribution histograms, scatter plots and data files can also be instantly generated. All experimental data can be instantly transferred to an Excel spreadsheet or saved in a data table . Example of data output to Excel. All counting results can be instantly saved to a data table.